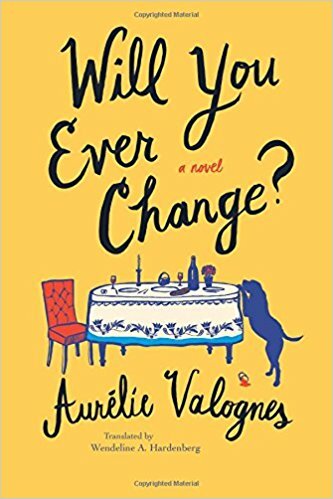 The latest book by Aurélie Valognes, Will You Ever Change, is a look inside the Le Guennec family: Martine, Jacques, and their three sons and respective significant others. The girls aren’t completely innocent, but Jacques does nothing to help the strained relationship between the girls and their in-laws. He doesn’t make things easy with his wife, either. They have a very old fashioned relationship where he worked to bring money home and Martine did absolutely everything else. Martine is tired of being taken advantage of by her husband and of not having great relationships with her daughters-in-law so she gives Jacques an ultimatum: be kind and considerate to his family or leave it. Out of Sorts is the first book I read by this author and I really loved it. These books are similar in that they focus on a really grumpy person changing themselves for the better. Another book of this type, A Man Called Ove, I finished today and may have had tears in my eyes at work.